Percakapan dalam bahasa inggris ketika berkunjung ke Thailand (Visit to Thailand) bisa memperlancar perjalanan wisata Anda di salah satu negara ASEAN tersebut. Bahasa inggris cukup dikenal luas oleh masyarakat Thailand khususnya di kota besar dan kaum muda sehingga Anda tidak akan kesulitan melakukan percakapan dalam bahasa inggris meskipun Anda juga perlu penyesuaian terlebih dahulu karena logat bahasa inggris mereka tetap terpengaruh dengan logat bahasa thailand. Ridho : Hey, Ferry, you have come back already from Thailand? Why is so fast? Halim : Yeah, Fer. I thought you would spend about one more week there. Ferry : Yeah… Unfortunately, that is not going to happen, guys. I have school on Monday. My parents didn’t allow me to skip the school for a couple of days. So, we just decided to go home earlier. Halim : Oh, that’s too bad. So, did you have fun? Ferry : Yes, of course. Although 4 days was so short in time for me, but I was quite having fun. Halim : Well, let me hear your stories about that white elephant land. I hope it was a nice place to visit. Ferry : According to my opinion, Thailand can be one of the best places you can visit in Southeast Asia. 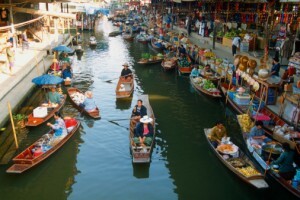 Thailand has its own beauty over other countries in Southeast Asia. Well… I and my family started our days in Thailand by staying in Bangkok. Halim : Bangkok is the capital city of Thailand, isn’t it? Ferry : That’s right, Halim. And… from Bangkok we departed to Chiang Mai. Chiang Mai is a big city but I felt like I was in a small town. It’s located in the Northern Thailand. We spent our days in Thailand in Chiang Mai. Ridho : What are the best things from Chiang Mai? Ferry : Well… we had all sorts of excitements in Chiang Mai. It was the really fun when I had to ride an elephant. Halim : Ride an elephant? You mean like ride on its back? Ferry : Yeah. You know that I don’t really like big animals but my family forced me to ride the elephant. Although there was a caretaker who helped me to ride the elephant but it was terrifying and exciting at the same time. Ridho : If I were you, I would have really enjoyed the ride. Ferry : And then, by the night, we visit a night safari. Ferry : Night safari is an exciting tour of going around the Chiang Mai Zoo to see the animals by taking a bus at the evening. It was more fun to see the animals at evening than at daylight. Since it was evening, we saw the animals by using the light from the bus and flashlight we bring. Halim : That is cool! Ferry : And then the last place we visit was Mae Ping River Cruise. We had challenging and exciting river cruises there. So, if you have any chance to visit Thailand, just don’t miss it. Ridho : Very well, I’ll note Thailand to be one of the places I will visit in Southeast Asia someday. Halim : Me, too. Thailand sounds fun. Thailand sounds fun = Thailand kedengarannya menyenangkan.